Griffin, Georgia is a long way from the ghost town of rowdy Fort Griffin, Texas, but they both have something in common: Wild West legend Doc Holliday once lived in both places. 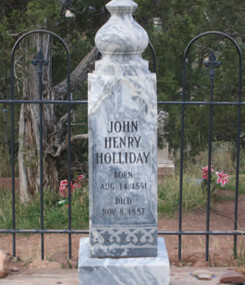 But only his Southern hometown has a real ghost story to tell: Although Doc died of consumption and was buried in the mountains of Colorado, some say his body was later moved back home and now lies in a quiet grave on a grassy hillside in Griffin. 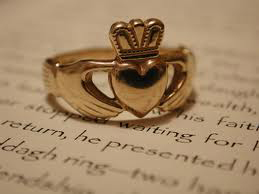 There’s a bit of Ireland running through the Southern Son saga, a little Claddaugh ring that Mattie Holliday inherits from her Grandmother Anne O’Carew Fitzgerald, and that she gives to John Henry as a symbol of their affection. It first appears in Book One, Southern Son, and comes back again and again through the three books and into the Postscript at the end. Can’t tell you how or why or where without ruining the story for you, but it’s more than a plot device: it’s a physical symbol of spiritual things and of the emotional story that winds through the adventure of Doc Holliday’s life. You’ll see it as part of the logo on the cover of all three books. Doc Holliday grew up in a world of such things, in a land where Indian legends still echoed in strange names like Etowah and Ocmulgee, where Irish ancestors left tales of wood sprites and banshees, where black slaves told stories of haints and bogymen and “boo hags” that hid in the dark piney woods. When a beloved family member passed, even good Christian folk covered all the reflective glass in the house lest the dearly departed should peer back at them from beyond the veil. So one would expect that the Holliday’s house, built in the 1850’s and a place where generations of family members lived and loved and died, should be filled to overflowing with spirits. How could such a classic Southern mansion not have a few classically Southern ghosts to go with it?